My current favourite for theme of the year is divergence. In the global economy, growth is not as broad-based as it was just a few months ago. The US economy is strengthening, with GDP growth at 2.9% in the year to Q1, unemployment rates at close to 50 year lows, inflation ticking up, and an expectation of ongoing Fed rate rises. The picture is different in Europe and Japan, with weaker than expected GDP growth and other economic measures over the past few months. Although the small economy record suggests that this is more of a levelling-off than a reversal of the recovery – several small European economies are still generating growth rates around 3%, and Singapore’s Q1 growth rate was 4.4% - there is a growing gap between growth rates in different regions of the global economy. Stresses are also appearing in several emerging markets, partly due to rising interest rates and USD appreciation; and Italy reminds of the ongoing disparities within the Eurozone. This divergence will add complexity to macro management through 2018. And there is increasingly obvious political divergence. The recent constitutional changes in China made explicit what has been apparent for some time: that China is following in its own course, and that gradual convergence of China to a Western economic and political model is not happening. The world has not seen ideological divergence between its leading powers for some time. More generally, after a few decades of convergence of political systems, there is reduced confidence that political systems will evolve inexorably in the direction of liberal democracy (despite occasional positive surprises like the election results in Malaysia). There is also obvious divergence across the West, largely due to an uncompromising, unilateral US approach to international affairs. As Donald Tusk tweeted last week, ‘with friends like that who needs enemies’. The EU is still figuring out its collective response to US trade threats, as well as to US decisions on Iran, with different views on the extent to which to confront the US. But increasingly, the EU, Japan, and others will be pursuing a different path. Ms Merkel is in Beijing today, discussing trade and other issues. Under better circumstances, the Europe, Japan and the US could have exerted coordinated pressure on China to open up its markets. But as it is, we should expect some realignment. 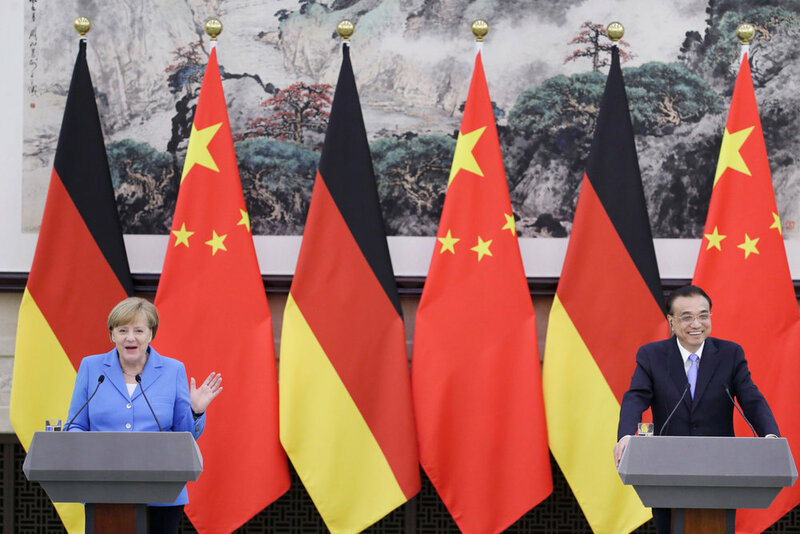 Note that one of the Chinese ‘concessions’ to the US was to lower tariffs on auto imports, which will benefit German firms more than US firms – even as Mr Trump remarkably initiates a national security investigation of auto imports into the US. Some of the certainties of the post-World War II environment are fading away. There is an increasingly regional flavour to the global environment, with Eurasia taking over from the Atlantic as a key organising device. This political divergence will shape the global economy. Looking forward, some longer-term drivers of economic divergence are also becoming increasingly apparent. Convergence has been a major global macro theme over the past several decades. Globalisation and technology have driven a remarkable compression of the global income distribution (even as the income distribution within many advanced economies has widened). China is the stand-out story, but this dynamic can also be seen across emerging markets. But these forces of convergence are weakening. Even with the recent recovery, world trade growth remains lower than in the few decades prior to 2008. And a more fragmented global economic system, with trade and investment barriers, will place constraints on economic convergence. There are also other structural dynamics. Across emerging markets, manufacturing shares of GDP and employment – a key driver of economic convergence – are peaking at lower levels than previous generations of emerging market economies (‘premature deindustrialisation’). This is partly due to increased capital intensity of production, but also to rising cost structures in emerging markets, and increasingly to new technologies such as automation. This will create significant challenges to the standard model of economic development. And aging populations in many emerging markets will further constrain the convergence process; the IMF notes the risk that some countries will ‘get old before they get rich’. And disruptive technologies are likely to lead to a broader range of economic outcomes across advanced economies. These technologies offer the prospect of enhanced productivity growth (although this is not yet showing up clearly in the numbers), which is important given the aging populations across many advanced economies. However, although beneficial in aggregate, we should expect a greater measure of divergence in economic performance. The extent to which countries capture value is contingent on factors such as the existing stock of human capital and firm capability; some economies will respond much better than others (I have argued that many small advanced economies will do relatively well). And at firm-level, there is growing evidence of performance divergence between digital leaders and others. The point is that these benefits will be unevenly distributed. There are economic winners and losers from every period of disruptive change. The arrival of the Industrial Revolution led to a process known as the Great Divergence as Western countries were able to benefit from this new technology to generate superior rates of growth. Globalisation over the past several decades reversed this process, allowing for broad-based convergence. The combination of supply side factors like technology and demographics with the ongoing structural changes in the global system will have disruptive effects over the next decade and beyond. A period of sustained international economic and political divergence seems increasingly likely.